​"A team of Practitioners from Devoran Pre-school have recently attended a course of training for Level 2 Food Hygiene with Kate Woolven. We found the course to be tailored to our needs and very relevant to the setting that we work in. The morning was interesting, fun and informative – it flew by! I will be sending more staff members on Kate’s training courses as she provides the relevant statutory training for our workplace in a relevant and engaging way! Thank you Kate!" "Wired Cornwall thoroughly recommends Mrs Kate Woolven to anyone that requires first aid training in any establishment and with anyone whose business is swimming pool related. Wired asked her to run a first aid course and as we are a stroke and acquired brain injury rehabilitation centre we had very specific requirements. Kate conducted the training day with great professionalism and followed it up with a necessary health and safety audit, as well as re-stocking first aid boxes (and any additional equipment we required). Furthermore she introduced me to one of her business colleagues who carried out all our PAT testing requirements and fire extinguisher servicing. She is a very professional lady who delivers promptly and efficiently with great humour and we felt very lucky to have been introduced to her. She is very competitive in price against other companies and I would happily and re-assuredly recommend her to anyone." "Kate delivered a paediatric first aid course at our setting for a group of my staff. She was professional, and yet approachable, in all aspects of the training. The delivery was first class and all of the staff that attended stated that it was one of the best first aid courses that they had attended as they did not feel constantly under pressure during the two days. We will definitely be using Kate again for further training." and we all enjoyed the day very much indeed. Katie (my sister in law) was also very positive on the drive home. If there had been any negative aspects from her point of view, she would have certainly told me, but she had nothing but good comments about you both, and about the day. Kate, you've been a pleasure to 'do business' with! I have welcomed your prompt, positive, patient and humourous responses and I have valued your tenacity in driving this through. You achieved a perfect blend of keeping the pressure on me, without becoming a nuisance or a pain. Not an easy thing to get right, but you did. So well done, both of you, and thank you very much indeed. I hope our paths will cross again on many occasions in the future! Kate, I wish you every success in building your new business. I'm sure you will fly!" 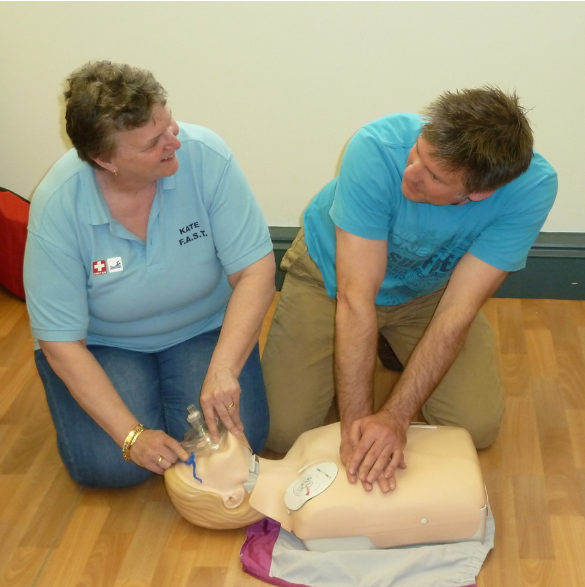 Pictured is FAST’s Kate Woolven helping club member Marc Paxton get to grips with Cardiopulmonary resuscitation (CPR). Kate stressed the importance of this simple but lifesaving technique throughout the course. She told us: “If I could spend a few minutes imparting one piece of first aid knowledge to everyone in the country, it would be CPR.” Also included in the training was how to use St Ives’s new defibrillators, funded by Rotary Club of St Ives. Everyone who attended was awarded The Royal Yachting Association’s First Aid Qualification and an additional endorsement to use Category C Medical Stores. All those attending thanked ... Kate Woolven for making the subject engaging and above all good fun." ​"Thank you for making the training so engaging last week, of course we needed to put it into action the following day when a child placed another in a headlock and didn't let go! So, first aiders at the ready and in action with one child perfectly fine as an outcome. Thanks for the information you've shared, the CPR sheets are in our first aid boxes." "Her training is excellent, very practical and delivered in a really engaging way! If you are seeking similar training in the future then it is well worth giving her a call. She does all sorts of training including H&S, First Aid, Food Hygiene as well as Consultancy if you just need someone to give excellent advice and assistance to your business. Thanks Kate for such a great session - see you again next year for our refresher training." “I have now attended two courses run by Kate. Both courses were absolutely brilliant - very informative and lots of fun! Who would have known you could be smiling and laughing in a Food Hygiene course? I am now able to confidently apply the subjects I’ve learnt in my professional and personal life. Thank you Kate”.